The day started with marginal winds and low visibility, but cleared up after lunch. As we’ve hit the peak of the season, the HMP Core Team held a meeting after breakfast to insure that everything runs smoothly. The K10 Robot team from NASA Ames, led by Dr Matthew Deans and including Dr Trey Smith, Susan Lee, Vinh To, Eric Park and Dr Hans Utz, tested instruments and components and traversed with the robot during a break in the weather. Kelsey Young and Byron Adams (both PhD students in the Geology Dept. at ASU) did traverse planning for this year’s follow-up mission. The robot team will program the traverse coordinates into the robot accordingly. 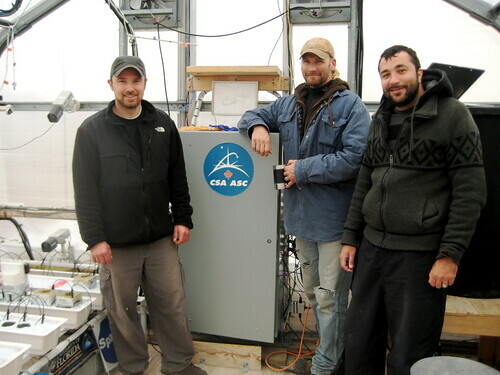 The Arthur Clarke Mars Greenhouse team, Matt Bamsey (CSA), Talal Abboud (CSA) and Thomas Graham (Univ. of Guelph) wrapped up and packed and will be monitoring the greenhouse remotely until next HMP season. They departed this evening, along with Drs Robert Ferl and Anna-Lisa Paul (both faculty at the University of Florida). The rest of the CRUX drill team: Dr Brian Glass (Senior Scientist, Drilling Automation, NASA Ames), Dr Sarah Thompson (NASA Ames) and Shannon Statham (Georgia Tech, Ph.D. student), arrived on Devon Island this evening. They reunited with their fourth team member, Mateusz Szczesiak (Honeybee Robotics), who has been at the HMP Research Station running tests as part of his research for Honeybee. I’m a Minnesota inventor that has invented a portable home gym that works in outer space, weighs 4 lbs., breaks down, and enables a full body workout. A carbon fiber device would weigh less. How in the heck do I show this to anyone at NASA? You can see it demonstrated at my web site kefty.com. It comes in tensions from 5lbs up to over 100lbs. Could I get some feedback from you? I’m also interested in getting one to the trapped Chilean miners. Do you know any of the team that went down there? My machine breaks down and would easily fit down the hole. I wrote about it on my blog.